I'm ecstatic that so many of you enjoyed the Gathering Momentum worksheet! I've been doing them too, and they're so fun that I get sad when I'm finished! So of course I needed to make another one! I used to waste a lot of life having negative thoughts about myself. Sometimes they still creep in and it is SO ANNOYING! No one should wake up feeling guilty for something delicious they ate, or feel insecure about their inherent beauty! 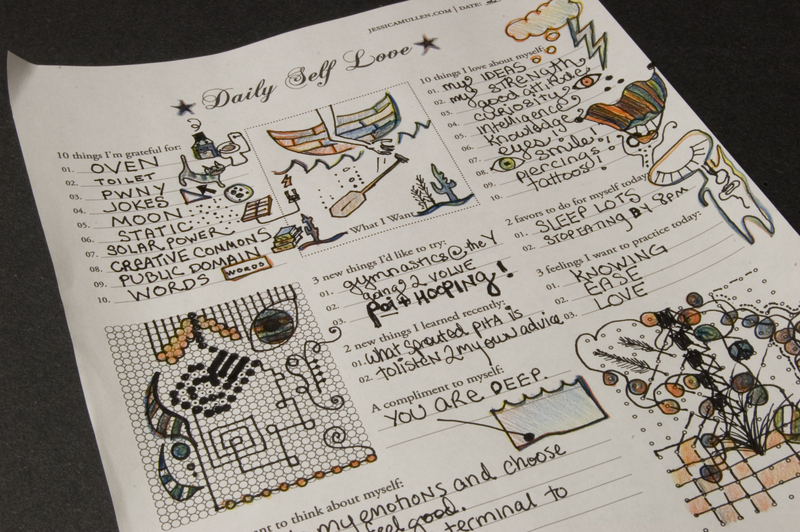 I made the Daily Self Love worksheet to stomp out those negative thoughts for good. I tested it out to see if it really works. I'm most susceptible to negative thoughts about myself when I first wake up, so I left a worksheet on my bathroom counter and filled it out FIRST THING yesterday. My day was immediately transformed! I hopped in the shower thinking about all the things I'm grateful for, then excitedly went about my awesome day. I did another one before going to bed last night, when I'm most likely to mindlessly veg out and let my mood drop. It really helped me alter my attitude and go to sleep feeling fantastic! Download the Daily Self Love worksheet here! I guarantee this worksheet will help anytime body or confidence issues start slithering in. It will even improve your feelings of self love if you have no negative thoughts about yourself at all. Try one out and see if it makes you like yourself a little bit more, I promise it will! Most of the worksheet is self-explanatory, but one section deserves special attention: 3 feelings I want to practice today. First, identify how you would like to feel today. Euphoric? Healthy? Abundant? Write the feelings down and then spend up to a minute practicing each feeling. The idea behind it is that when you practice a specific feeling, you attract experiences into your life that produce the same feeling. So when you take a minute to practice euphoria in the morning, you'll end up in some euphoric situation in no time! One method to practice a feeling is to close your eyes and visualize yourself experiencing the feeling. For example, I often want to feel creative inspiration. So I close my eyes and picture how I behave when I am inspired - I'm bouncing all over the place, often typing frantically, completely focused and unable to stop what I'm doing until I'm finished. The important part is that you actually feel the emotion during the exercise. You can't fake it! Now you can buy the Daily Self Love Workbook! 8.5x11'', 100 worksheets, coil bound, $15! P.S. Want more ways to love yourself? Read Gala Darling's ultra-inspiring Playgirls Guide to Radical Self Love posts! Also, I'd love to see your completed worksheets if you want to leave a link in the comments! Meditated for 15 minutes at a park looking at the moon and it was heavenly! I really really like your gathering momentum worksheet, and this one is great as well. Damn, you did it again! This one brought tears to my eyes – wow! Aww thanks Cynthia! Isn’t it wonderful to feel tears of joy from a little self-lovin? SO CRAZY. Hey Erin! Thank you for sharing how it helped you! Your “favors” for yourself are so exquisite, they’re exactly the type of thing I had in mind. Do you put Torley on a leash? And you’re still playing bass, yay! You are so musically gifted, I love hearing that you’re still going strong! xoxo so happy to be in touch with you darlin! Hehe, all it took was seeing your music comment… now I have to go do something. ;) It’s so great to be in touch w/you too! Can’t wait to see you guys! xohugs! One thing that I loved the most in the self-love worksheet was the “10 things I am grateful for” section. Only recently (since the lat 3 days), I have started practicing being thankful for the happy things that happen to me and it has been amazing! I have suddenly noticed more and more happy things happening and things which were earlier a problem suddenly turned into pleasant experiences! So yes, thank you for sharing this wonderful worksheet. Hey Meghashyam!! So happy it’s doing the trick for you!! Thanks for telling me!! I’m so excited that I found this!! I must have missed this post somehow and have been wondering where I can get the awesome worksheet you’ve been showing pictures of — I even asked about it on another post. Interestingly enough, I watched “The Secret” last night and one of the things I asked to manifest today was THIS WORKSHEET for FREE! You see.. I thought it came in the “self love workbook” to purchase — but today I clicked on the word “Worksheet” in your tag cloud and HERE IT WAS! Hooray for LOA!!! Thank you for posting these worksheets! Mouse, YAY!! I love how that all worked out!! Ha sorry I hadn’t answered your question earlier, I hadn’t gone through my emails in almost a week! I love this so much, words cannot express the awesomeness of the Daily Self Love worksheet! I write about self love on my blog and strive to practice self love every day. Self love is such an important influence on my happiness and my success and I’m grateful to be inspired to new heights of self love. Thanks for this! Oh bummer! When I went to download the worksheet I’m getting an error. Is it still available for download? Yes! I tried it again last week and it worked. I’m really excited about this worksheet. I’m all about self love and I look forward to linking to you on my blog. I did a “self love” links (below) not too long ago and plan on doing another one eventually! I’m so excited I randomly ran across your page, I am running a girl group this summer for adolescent girls with my job and I am going to be focusing on self love and all that jazz, I also suffer from depression, anxiety and negative thoughts so this is something i’m going to use as well! I hope you still check this site. I’m so thankful for this awesome worksheet Iwas going to create one myself but could not get my thoughts in order and time is of an essence camp starts tomorrow. Thanks again!! Hi Karen! I am so so happy you found the worksheet! I would LOVE to hear how it works out in your girl group, feedback would be so wonderful! I plan on making more worksheets of this nature and would love to know what people enjoy the most. Enjoy your camp!